In the project we came across the challenge to find information within a list of objects in the debugger. in the ALV display you will only see all the objects instances. Using debugger scripts (basics here Former Member ) you are able to iterate on the internal object table and work with the values. In the second example I will show you how to display object information in an ALV. 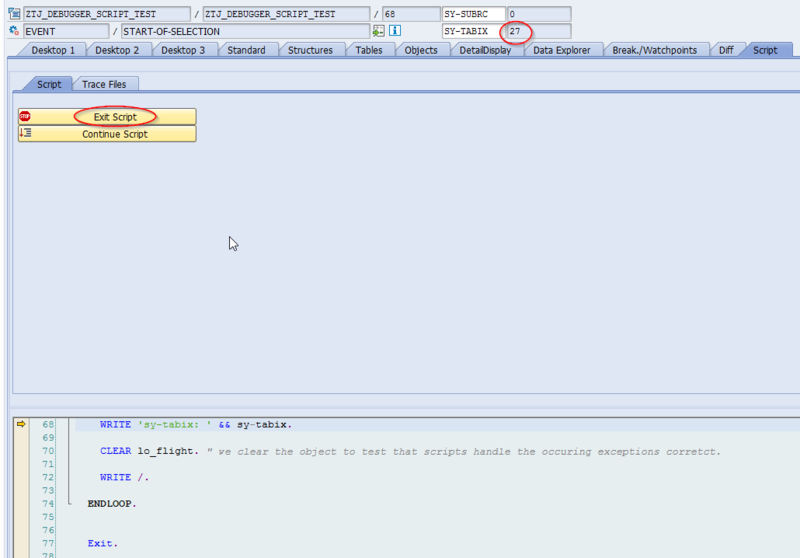 Using conditional breakpoints helps if there is a loop over all these objects in the #ABAP code. 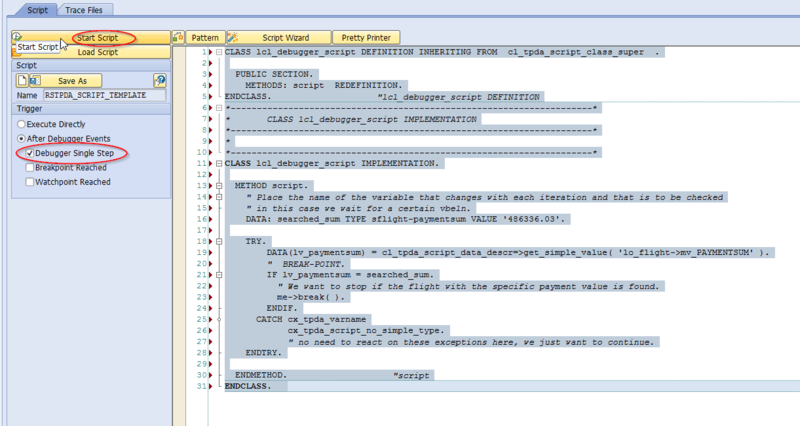 In the first example we will have the same functionality using a script, but in the end this could be much more powerful using more feature of the ABAP language if the conditions are met. I wrote a demo Report that includes two other reports aka debugger scripts at the bottom to use with this report. It is based on the sflight table and should compile on >NW7.10. ( if not just change these fancy modern commands ). The report selects 50 lines of sflight and creates a table of simple POAOs where the data is stored inside the objects only. These objects are defined in the top of the report. 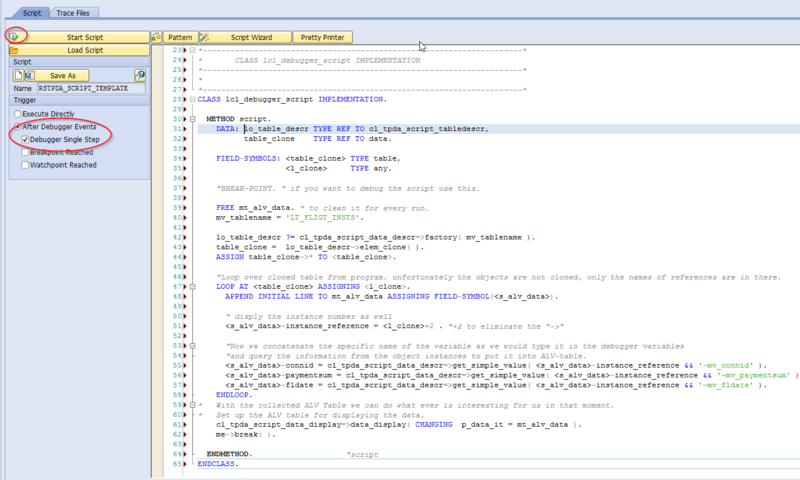 One of the mayor issues / security features of debugger scrips is that you can not create them in a non open SAP System. If needed you should integrate them somehow in your Transports manually. 1. Copy the report at the end of the post into your system. 3. Now we switch to the “Script” tab. Here we can do all the scripting. Copy the local class of the first script report below and remove 3 columns of * comments. Pay attention that “Debugger Single Step” is selected an run the script. 4. 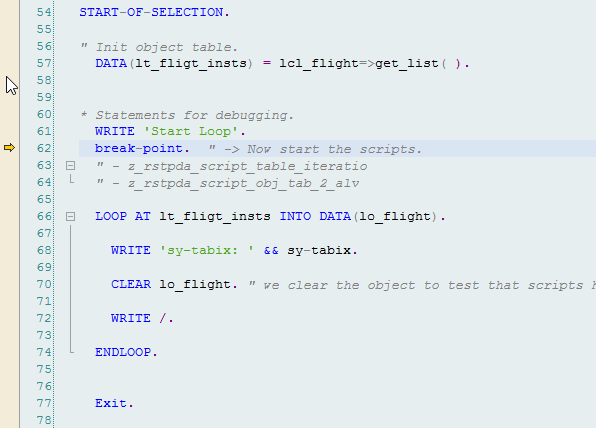 The debugger stopps within the loop at sy-tabix 27 where the object contains the requested payment_sum. Great! Ok, this is also possible using conditional breakpoints in such a simple scenario. Let’s make it a bit more complex. Now we want to see all the information of the object before we iterate over them. 5. Run the program again, when the debugger stopps you paste the code of the second local class. Run the script again and you will see an ALV with the listes information of the classes. *& Report is based on the SAP flight model data. *& Created by: @Timo_Tohn 2018.
tt_flights TYPE STANDARD TABLE OF REF TO lcl_flight WITH DEFAULT KEY. CLASS lcl_flight DEFINITION CREATE PUBLIC. constructor IMPORTING is_sflight TYPE sflight. 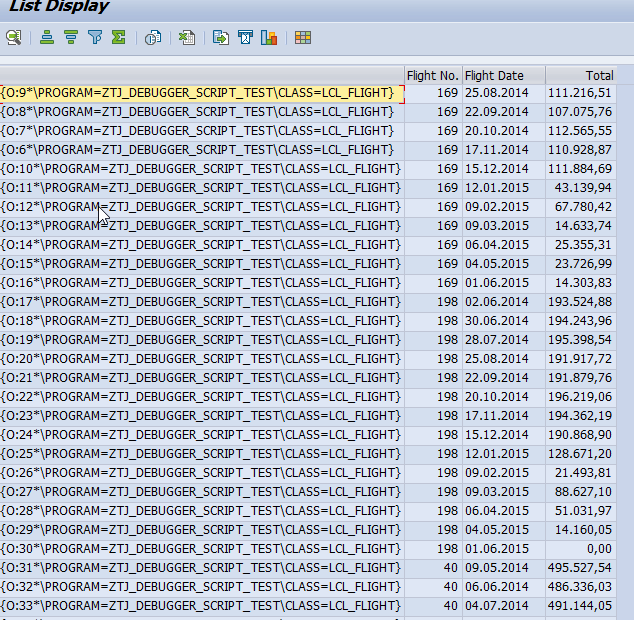 SELECT * FROM sflight INTO TABLE @DATA(lt_flights) UP TO 50 ROWS. rt_flight_list = VALUE #( FOR <wa> IN lt_flights (  NEW lcl_flight( <wa> )   ) ). break-point.  " -> Now start the scripts. LOOP AT lt_fligt_insts INTO DATA(lo_flight). WRITE 'sy-tabix: ' && sy-tabix. CLEAR lo_flight. " we clear the object to test that scripts handle the occuring exceptions corretct. * Save these two reports below as independent reports in your system to use them as Scripts. * OR paste the local classes accordingly into the debugger script tab (only one at a time). * then use Start "Start Script". **** value within an object is found. **** Created by: @Timo_Tohn 2018. ***CLASS lcl_debugger_script DEFINITION INHERITING FROM  cl_tpda_script_class_super  . ***    " in this case we wait for a certain vbeln. ***    DATA: searched_sum TYPE sflight-paymentsum VALUE '486336.03'. ***        DATA(lv_paymentsum) = cl_tpda_script_data_descr=>get_simple_value( 'lo_flight->mv_PAYMENTSUM' ). ***        IF lv_paymentsum = searched_sum. ***          " We want to stop if the flight with the specific payment value is found. ***            " no need to react on these exceptions here, we just want to continue. **** instances in an ALV. ***      "! Name of the with objekt instances of the program. ***          table_clone    TYPE REF TO data. ***    "BREAK-POINT. " if you want to debug the script use this. ***    FREE mt_alv_data. " to clean it for every run. ***    lo_table_descr ?= cl_tpda_script_data_descr=>factory( mv_tablename ). ***    table_clone =  lo_table_descr->elem_clone( ). ***    ASSIGN table_clone->* TO <table_clone>. ***    "Loop over cloned table from program. unfortunately the objects are not cloned, only the names of references are in there. ***    LOOP AT <table_clone> ASSIGNING <l_clone>. ***      APPEND INITIAL LINE TO mt_alv_data ASSIGNING FIELD-SYMBOL(<s_alv_data>). ***      <s_alv_data>-instance_reference = <l_clone>+2 . "+2 to eliminate the "->"
***      "and query the information from the object instances to put it into ALV-table. ***      <s_alv_data>-connid = cl_tpda_script_data_descr=>get_simple_value( <s_alv_data>-instance_reference && '-mv_connid' ). ***      <s_alv_data>-paymentsum = cl_tpda_script_data_descr=>get_simple_value( <s_alv_data>-instance_reference && '-mv_paymentsum' ). ***      <s_alv_data>-fldate = cl_tpda_script_data_descr=>get_simple_value( <s_alv_data>-instance_reference && '-mv_fldate' ). ****   With the collected ALV Table we can do what ever is interesting for us in that moment. ****   Set up the ALV table for displaying the data. ***    cl_tpda_script_data_display=>data_display( CHANGING  p_data_it = mt_alv_data ). So cool. I learned something – I can go home. Creating a blog from a twitter poll – genius. Pulling it all together with screen shots and solid explanations is a great idea. I’m still not using Twitter at all. Sometimes all the social media we have at our fingertips is crazy. Former Member you should start reading #TwitterRadio on SAP Topics it really helps a lot to find relevant information, events, news etc. That’s true. It’s always a time thing for me. And with limited characters I never think that people can give a lot of relevant information. Facebook – skim this. There is no way to read everything. I work on a computer for a living. Then when I’m not working, I still spend time on the computer. It really goes down in the summer when I can get outside and ride my horse. And, yes, I play games on the computer too! I believe some discussions we would have on SCN before moved to Twitter instead. Not to mention you’ll find many old SCN friends there, even those who moved away from the SAP world (gasp!). This is very interesting, need to try this out soon.